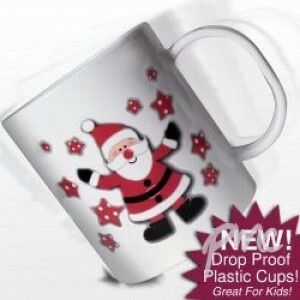 Now your little one can really get into the Christmas spirit with their very own Santa cup! This cup is made from plastic and has a chunky handle so it's drop proof and perfect for little hands! Any child will love the very jolly Santa design on the front, and when they see their own name on the back they will be very excited! You can personalise the cup with any message of your choice, but looks great with " (Child's Name)'s Special Christmas Cup! ".